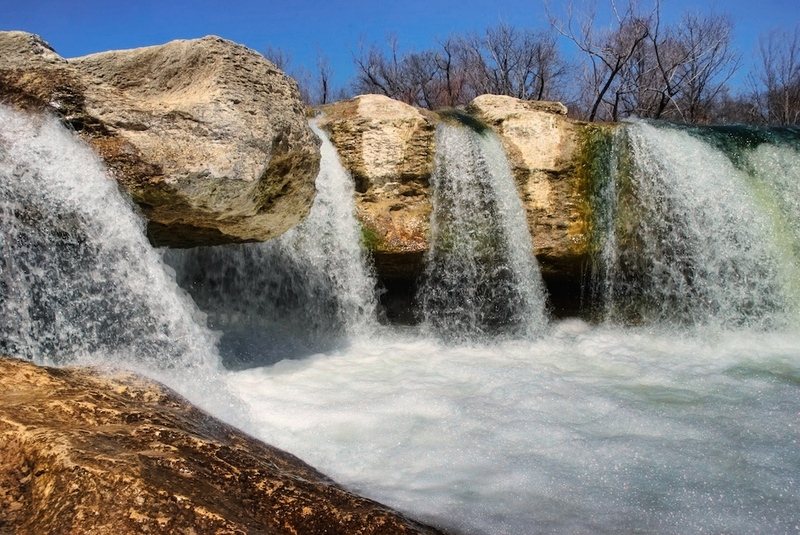 McKinney Falls State Park lies just on the edge of Austin, sort of near our airport. It is a nice quiet place and although it isn't large, the waterfalls are gorgeous. I met my good photo buddy Pete Talke there yesterday for a little photowalk. We have had some nice rain lately, and even some snow, and there was a lot of water and it was moving fast! It was a great day to be out taking these types of shots. We hiked around the Upper Falls for a bit, taking numerous pictures of course, and then we headed down to the Lower Falls, which is where I got this shot. When we arrived at the Lower Falls, we both immediately saw a nice big rock that sort of stuck out into the current, and it presented an excellent spot to get a shot from. We climbed around and took pictures from all sorts of angles. For this shot, I got out on the edge of a partially submerged rock. I could feel the spray of the waterfall on my face and see it on my lens. But hey, it was worth it right? This is a 6 exposures HDR taken at f/11, with exposures ranging from +2 to -3. I merged them into an HDR in Photomatix, which took a while. The reason it took a while is that I decided to take it slow. I often find myself so excited that I rush to get a picture processed. Really, what's the hurry Jim? So this time I took my time with all the sliders in Photomatix until I got it looking just the way I wanted it to look. Then, I made some adjustments in Photoshop Elements. Again, I took this one slow and easy. I usually make adjustments to Contrast and do UnSharp Mask, but this time I also spent some time in Hue/Saturation and Lighting/Shadow. After that, I ran it through the new v4 of Topaz Adjust for a little "pop". Finally, I removed lens spots from all the waterfall spray in Aperture, and I was done. Hope you like it!